As Max for Live has matured, this tool for extending the functionality of Ableton Live has played host to a growing wave of brilliant custom tools – enough so that it can be hard to keep track. This month saw a few that deserve special mention. In particular, two tools help make MIDI mapping and automation recording easier in Live, and point the way for what the host itself could implement in a future update. (Live 9, we’re looking at you.) And in a very different vein, from Max for Live regular Protofuse, we see an intriguing alternative approach to sequencing. Clip Automation does something simple: it patches a limitation in Live itself, by allowing you to record mapped automation controls directly in the Session View clips. (As the developer puts it, it grabs your “knob-twisting craziness in Session View.”) The work of Tête De Son (Jul), it’s an elegant enough solution that I hope the Abletons take note. Mapulator goes even further, re-conceiving how mapping in general works in Ableton – that is, how Live processes a change in an input (like a knob) with a change in a parameter (like a filter cutoff). Live does allow you to set minimum and maximum mappings, and reverse direction of those mappings. But the interpolation between the two is linear. 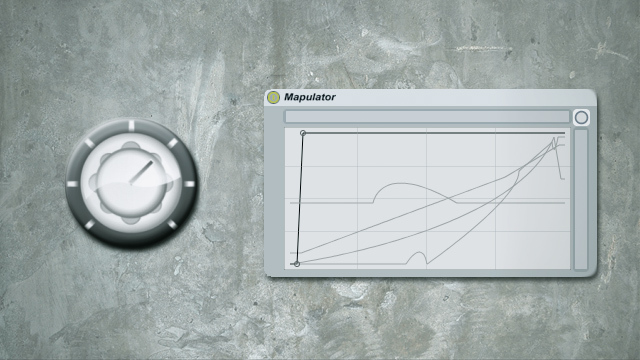 Mapulator allows you to ramp in curves or even up and down again. Again, this seems to me not just a clever Max for Live hack, but an illustration of how Ableton itself might work all the time, in that it’s a usable and general solution to a need many users have. Sometimes the itch Max for Live patchers scratch is an itch other people have, too.